@Chrisswift8 Hahah , I'm guessing you use emoji codec ? “@Ang_cdg: If you don't have #emoji you're probably not as cool as me ” <~ #TeamiPhone ??!! Me too RT"@juliannapraado: I love emoji"
@lencalvo Tara! Sa katips yun diba? Oye mamiii @LAUcubanita mañanaaaaaaaa noche de #OVO !!!!!! Q emoción!!!! 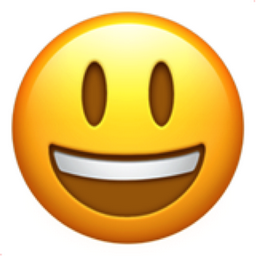 Like Smiling Face with Open Mouth Chronological Emojitweets 61?